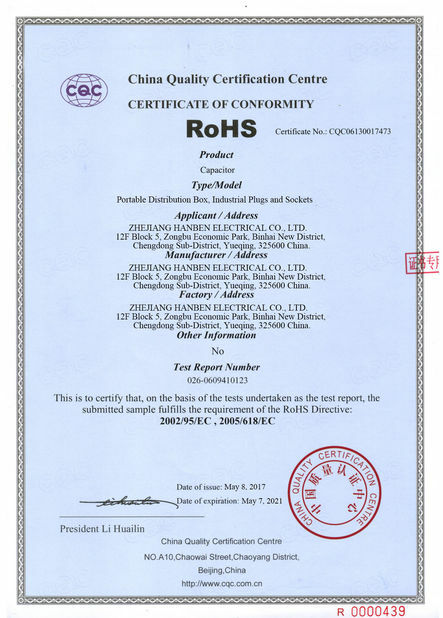 Zhejiang HANBEN Electrical Co., Ltd. is one of the leading manufacturers in the field of Portable Distribution Boxes and Industrial Plugs and Sockets in China. The company is located in Liushi, Wenzhou, the capital of China’s low-voltage electrical appliances. 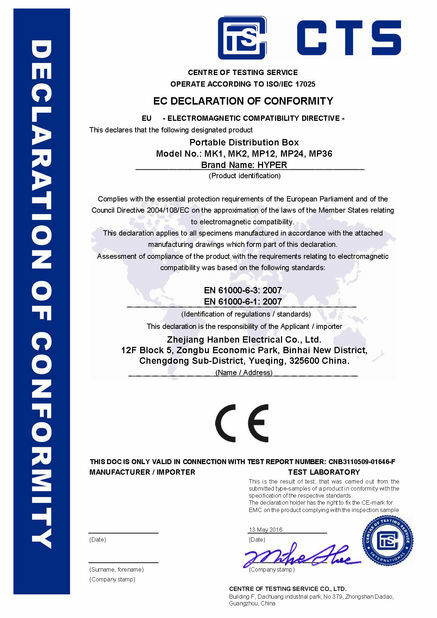 HANBEN has passed ISO9001:2008 quality management system approval and most of our products have obtained CCC, CB, CE, GS, BS, UL, TUV, Semko, KEMA, SAA, C-tick, REACH and ISO9001 approvals. At present our products are mainly exported to USA, Germany, France, Belgium, Sweden, Poland, Hungary, Turkey, Australia, South America, African countries and etc. HANBEN is enjoying high reputation in domestic and international market for its superior quality and has already established cooperative relations with customers from over 40 countries and regions in the world. HANBEN people will keep and enlighten our spirit to seek excellence and create the higher and more value for our customers home and abroad. We highly praises the culture of "Idea is prior to action." HANBEN, the Chinese pronunciation of 汉本, means China & Safety in Chinese, whose quintessence is to cooperate closely with partners in business and keep high quality in products. We make and distribute not only an individual product, but a packaged solution more. A Solution is an innovative combination of technology, products and services providing a high value unified response to business customer's needs. We make the best effort to offer a safe, simple, efficient and innovative solution for our partner and customer up to our customer satisfaction. We believes in the culture of "Profession makes the quality and loyalty." 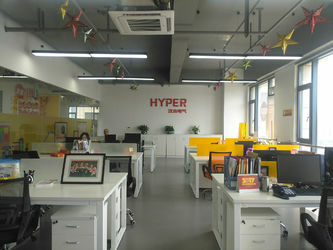 Our hardware facilities is complete with ISO9001:2008, IEC standard, China national standard and the related regulations of China Entry-exit Inspection & Quarantine Bureau, our software adopts the recent advanced ERP management system and we have our 3 senior national engineers, 6 electrical engineers, 15 technicians for R&D and QC. All the products from HEAN are of good and trustable quality. Each product obeys a strict and complete procedure and standard from research, design, prototype, component development, sample's test, mass production, quality control, after-sales service and feedback. We realize the importance of teamwork in such a competitive electrical field, we emphasize and deepen internal management, in the meantime we encourage to stimulate and give full play to the initiative and great creativity of our individual and team. The increasingly compartmentalized work is improving our teamwork efficiency, lowing our total cost and also customer's purchasing cost. We definite Service a dynamic process in each detail to satisfy customer's final satisfaction from its initial idea of a new product, its internal and external design, its combination with related products, mould and component development, sample and mass production, quality control, packing, sales & delivery, after-sales service and feedback to further circular cooperation in new item with customer. We maintain social responsibility to product and people, nature and future and in the meantime as one of our enterprise initiatives and innovations. We care about profit & lose, and more care about person & love, nature and future. HYPER is the brand of the high quality products for application and safety, but also aestheticism and philanthropy on the basis of human nature. We started our manufacturing of Portable Distribution Box, with experienced technical engineers team and top sales team. We grow fast for the good quality products and top sales team, and we started to manufacturer Industrial Plugs and Sockets after one year's research and development. As the growing of export business, we expanded our production lines and factory to meet the demands of the export orders. We started to manufacture the High Current Industrial Plugs and Sockets as the customers requirement. Now we built an experienced research and develop department, a strong sales department and perfect customer service department. At HANBEN we only manufacture and stock products which are of the highest quality. All products have been hand picked by a member of our purchasing department who continually review product performance and ensure they comply with all relevant regulations. We are authorized dealers for the biggest brands on the market. HANBEN Manufactures of a huge product range which is continually being added to on a daily basis by a dedicated purchasing department. If you cannot find what you are looking for on our website; contact our customer services team who will be happy to assist with your enquiry and find a product which meets your requirements. We endeavor to deliver all orders within 30 days of when the order has been confirmed. At HANBEN we try our best to work with customers in all circumstances. Generally we allow the products of ONE year from the date of the order for the goods to be replaced and delivered together with the next order. For more information, please contact our Customer Service team. If you have any queries about any aspect of our products, delivery, or an order which you have made, please don’t hesitate to contact our customer services team.